UPDATED: Prime Minister Erna Solberg, her foreign minister Børge Brende and leaders of the Nobel Peace Center in Oslo were among those mourning the death of former Israeli President Shimon Peres during the night. The Nobel Peace Center quickly set up a memorial protocol where others could pay their respects, and Brende will be attending Peres’ funeral on Friday. She recalled that Peres was especially keen during his last visit to Norway “to engage youth in the campaign for a peaceful future in the Middle East.” She said that youth who experience hope, recognition and are able to fully participate in society are the most important key to peace in any region. “Shimon Peres devoted himself to this vision in his last years,” she said. Peres had many supporters in Norway and was among the trio that won the Nobel Peace Prize in 1994, along with Israeli Prime Minister Yitzhak Rabin and PLO leader Yasser Arafat. Peres was foreign minister at the time and had been active in the formulation of the peace pact known as the Oslo Agreement. Norway has worked for years to help bring peace to the Middle East, and been disappointed and frustrated in the process. 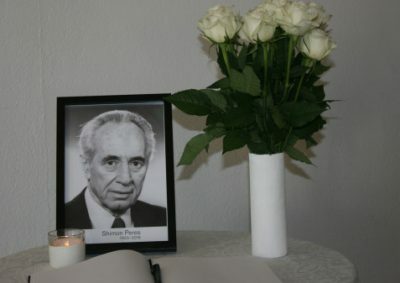 Peres was being honoured at his country’s embassy in Oslo with a condolence book, while the Nobel Peace Center in Oslo also set up a memorial protocol that would “be available to all who want a place to go to remember the Peace Prize Laureate of 1994.” A digital memorial protocol was also available on the center’s website (external link).